Christopher Robin is a hard-working man who has promised his wife and young daughter a getaway at a picturesque cottage outside of London. But then his boss adds to his workload and urges him to work on the project over the weekend – the same weekend he was to spend with his family. The company, his boss says, is depending on him. Thus, Robin does what he’s always done: prioritize his work over his family. His wife is discouraged and his daughter despondent, but it’s the only life he knows. What else would a stressed-out, workaholic dad do? Soon, though, he’s brought back to reality when a character from his childhood – a stuffed little bear named Winnie the Pooh – visits him. Pooh then takes him to the forest, where Christopher Robin meets other friends from his past: a tiger named “Tigger,” a pig called “Piglet,” a donkey known as “Eeyore” and a kangaroo they call “Roo.” Can they help him rediscover the simple joys of life? Disney’s Christopher Robin (PG) opens this weekend, starring Ewan McGregor as Christopher Robin; Hayley Atwell as his wife, Evelyn; and Jim Cummings as Winnie the Pooh. 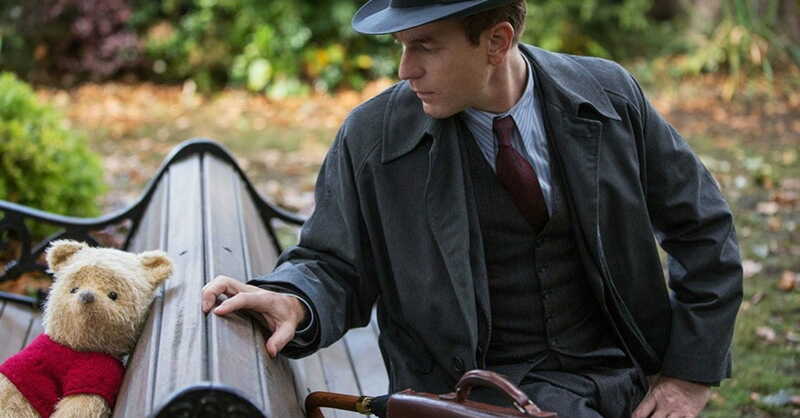 Unlike the 2017 Fox Searchlight film Goodbye Christopher Robin – which told the story of author A. A. Milne and his son, Christopher Robin – this film catches up with Christopher Robin as an adult. 1. It's different from other children's movies. 2. It encourages us to do "nothing." 3. It has valuable lessons for parents. Winslow Luggage is struggling to stay in business, and Christopher Robin’s boss expects him to work long hours to keep the business afloat. Every worker – the boss says – is either a “swimmer” or a “sinker.” Which one will Christopher Robin be? But his struggle with workaholism has been a life-long problem. In fact, his wife says she hasn’t seen him have fun or laugh in years. To her, raises and promotions don’t matter as much as family. “We don’t care,” she says. “We want you.” It’s a lesson straight out of Scripture. 4. It has valuable lessons for kids, too. Such as: Be kind. Encourage one another. Put others first. Even Eeyore’s (humorous) pessimism can’t bring everyone down. I watched Christopher Robin shortly after watching another children’s film, Teen Titans Go! To The Movies. The differences in the films are dramatic. I’d much rather my children model the characters from the former film, not the latter. And easily could have been rated G. There’s no violence, no sexuality (minus a couple of public kisses), and no language. Disney comes through again. We need more like this, Hollywood. 6. It has a mid-credit scene. It’s not essential to the plot, but if you stay in your seats you will see long-time Disney songwriter Richard M. Sherman, an Oscar-winning composer, playing and singing an original song. You’ve heard his music before, including in The Jungle Book and Mary Poppins. Christopher Robin doesn’t fit in my top 10 of favorite children’s films, but it’s enjoyable. My 10-year-old son loved it. The mixture of real-life action and computer generated characters is done so well that it’s easy to forget how difficult it is to achieve. It’s done so well, in fact, that the movie’s primary themes – such as family and generosity and kindness – can’t be missed. In my book, that’s always a winner.